Basketcase Crew and our Adventures. Our geocaching adventures as a family. Our main Summer holiday this year is back to Switzerland. After wrapping up at work we headed straight down the country to the Eurotunnel for a late evening crossing to France. We normally take an early morning crossing but this time thought we would try one on the evening and then grab a cheap hotel in France. We arrived just before 1am at the Lemon Hotel which is as basic as hotels go but did have a fridge in the room meaning we could keep our meat chilled at night. We have taken as much meat as possible to cut down the shopping bill in Switzerland. Hotel cost us 25 euros for the night. An early start for us as we wanted to drive through Belgium and Luxembourg to reach our destination for 2 nights. Luxembourg is easily the cheapest country for fuel so we decided to divert this way and also we had our eyes on 2 challenge caches that had not been found yet. Challenge "le N de matteoanne" The first cache we had to have found 50 Virtual caches to be able to find this one. The cache was a small tree climb and hidden in a nicely constructed fake bird box. We were pleased that we did actually get a FTF on it. Challenge "le deuxième E de matteoanne" The second cache we had to have participated in 10 CITO events. This cache was on terra firma and indeed another FTF for us. It was great to get the FTF's in Belgium and even better as we knew the c/o via Facebook. We grabbed 2 more caches on our route which were both at Autostops in Belgium and Luxembourg. We finally arrived at our destination Appart'City Strasbourg Airport near Strasbourg airport in the early evening. The hotel cost us 110 euros for 2 nights and 5 euros for the parking and it was a nice apartment with another fridge to keep our camping foods chilled. Originally we were going to get the bus into the city but we arrived later than expected and with lots of roadworks nearby we decided to have an early night and a couple of beers. Our plans for today were to explore a couple of villages of France. I do a lot of research on our trips and spotted these beautiful villages. We made a reasonably early start and thought we would head for Riquewihr first. Riquewihr is a fortified town with beautiful and colourful buildings. We paid 3 euros and parked up for 2 hours. We all loved our walk around this stunning village, certainly a place that we would recommend to others. 2 hours was enough time for us to see the village and find a couple of Geocaches too. Our next stop was Kaysersberg. Kaysersberg is another fortified village in Alsace,France. Both Riquewihr and Kaysersberg are doable in a day as they are so close together. Street with hills in background. Next up we had a quick visit to the bigger town of Ribeauville. It was close enough so we didn't want to miss out. As it was early afternoon we couldn't get a parking space in the town so parked up about 1km down the road but enjoyed the walk up. Ribeauville was still pretty but we feel it wasn't quite as nice as Riquewihr and Kaysersberg. We enjoyed a walk through the centre and it was much busier here. We have really enjoyed today so we headed back to hotel to relax and prepare for our drive into Switzerland tomorrow. An early start today as we head of to Switzerland for the next 7 nights. Today started with a bit of rain but didn't stop us from visiting the Statue of Liberty, not the one in NYC of course. This is a copy of Liberty that welcomes you to the birthplace of Auguste Bartholdi who was the creator of the Statue of Liberty. The rest of our journey was enjoyable, we bypassed the cities of Basil and Bern and drove down the edge of Lake Geneva. We noticed that there was another cache that had not be found yet so decided to go for that as it was only a 10 minute detour. As we pulled up at GZ there was a couple of cachers already there but they could not find it so we teamed up with them. We all decided that the co-ords were definitely out as the hint made no sense. The c/o happened to turn up and gave us a further hint and the sneaky cache was located. The FTF was shared so it was nice to have another FTF. Now off to La Fouly and the campsite. The last 20 mins of drive climbed up to 1600 metres and the views were spectacular. We arrived at Camping des Glaciers and were told to go and choose any pitch that was free. We found a perfect pitch. We managed to get the tent up in the dry but within minutes it began to rain. We have still to see the glacier in full and it doesn't look like we will see it today due to the low cloud. Today we decide to take a drive along St.Bernards Pass and over the border into Italy. We didn't expect to see much scenery but it was relatively clear there and we got some amazing views. The drive up into Italy was steep with hairpin bends which made Ian a little nervous. As the altitude here was much higher it was pretty chilly but it didn't stop us from having a good look round before heading slowly back down the mountain into Switzerland. We said that we should check out the nearest village to La Fouly on the way back and yet again we had a big climb up the mountains before arriving at Champex-Lac. There was a geocache here so after grabbing lunch we had a lovely walk round the lake finding the clues to enable us to find the cache. We found the cache and then headed back to campsite and then had a walk into La Fouly before heading back to camp for the night. The weather today was stunning, blue skies and bright sunshine. Today we can get a beautiful view of the glacier. We covered 750 metres of ascent and descent over a 8 mile round trip. It was hard going for us as we are not used to walking up hills but it was so worth it. The scenery looking at the mountain tops, glacier and down the valley was simply stunning expecially with the blue skies surrounding them. The satisfaction that we felt once we reached the lake made the uphill slog so worth it. Another gorgeous and sunny day for us to take a drive over the mountains to the big ski resort of Chamonix in France. The trouble with driving over country borders here is that you have to drive up and over mountain passes and although the scenery is stunning it certainly makes it harder to concentrate on driving. Chamonix is a beautiful town with some great views of Mont Blanc and surrounding mountains. We tried parking in the town but there were no spaces so parked around 1 km away which was perfect and importantly it was free. We had a pit stop at mcDonalds for Ben but Kate and I decided to grab a club sandwich from a little cafe. A nice walk round the town picking up a few caches, I being a virtual. We loved the few hours that we spent here and will definitely return. We spent the rest of the late afternoon / evening with a walk into La Fouly and even a quick pint at a bar. We then played some Table Tennis before retiring at our tent. Today we walked up through the woods on campsite to grab a couple of caches and then picked up our order of fresh bread from reception. After having bacon sarnies for breakfast we headed for a day out to Montreux. We parked up by Chillon castle but ourselves and others couldn't see where we had to pay to park. Kate managed to blag free parking by getting a disc enabling us with 3 hours of parking. It was a couple of miles walk to Montreux and we thought it would be nice to walk on the edge of Lake Geneva to it. It was a lovely walk with some nice views of the castle and mountains in the background. We walked to the Freddie Mercury statue and then had a McDonalds as a late lunch before walking back to the car. Back at the campsite we decided to have a walk into La Fouly again and enquire about some activities. There is a St.Bernard's card which cost us 9CHF each for a day which let's you do a variety of activities for free. So that is tomorrow sorted. Today is a much more chilled day as we have purchased the St.Bernards's card and have a ride down the mountain on Trotti bikes and a pedalo on the lake. There are other activities you can do for free with the card, including free public transport within the valley. So after breakfast we parked up in La Fouly and took the chairlift up the mountain. At the top we were given the bikes and down the mountain we came. This was brilliant fun. We loved this activity that much we booked another go in the afternoon, but first we are off to Lac de Champex for a little walk grabbing a few caches and a hour on a pedalo. We were hoping to go down the mountain here on the trotti bikes but unfortunately you have to book two days in advance. Something for us to remember for next time. We took the chairlift up the mountain and the views were stunning as expected. We think the St.Bernards card is a bargain. We will probably have it for longer next time. Now for the pedalo's. There was no queue so we were straight on them. It was a hour of bliss with some lovely views too. We headed back to campsite and had a late lunch before walking back into La Fouly to go on the Trotti bikes again. This time we set ourselves a time trail and Ian managed to get down the quickest in 14 minutes, Ben took 16 and Kate 24 mins. A truly marvelous day was rounded off with a beer in the nearby bar. This week we have had some fantastic weather and today looks set for some more. We are off to Leuk, a lovely little town on the river. We have visited the town before so instead we though we would take in a walk with a few caches on. The walk took us alongside the river and then looped back after crossing a bridge. We found 18 caches in the hot sunshine. I even managed to leave my shades at one of them but thankfully they were still there when we drove back there afterwards. On the evening we played some more table tennis and then watched a terrific storm up in the mountains. We have had a fantastic time in Switzerland but unfortunately today we had to pack up and leave. Thankfully we got the tent down dry and then headed off for Colmar in France. After failing at one parking spot as you had to text from a French sim card, we managed to find metered parking closer to the centre. 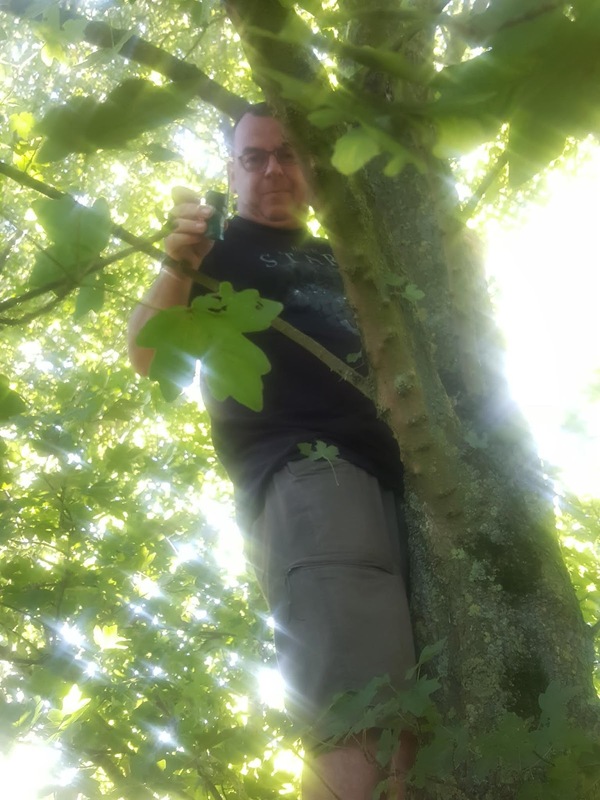 We spent a couple of hours exploring and finding a cache and ended up having a nice chilled beer before heading to our hotel a couple of miles away. Another day of travelling towards home and our next stop is Givet in France. Ian has stopped here before with friends so it was nice to go back. Once we had checked into our room we walked about a mile into Givet and despite grabbing a handful of caches we enjoyed a good chill out in a couple of bars. The last bar was near to the river and was in a lovely spot. There was not as much to do here as other places so we decided to have a nice early night. Today we are heading to Dunkirk for our last night before home. Before we left we really wanted to do a High favourited geocache. This was an epic adventure of around 2 hours with a tour walking and squeezing through tunnels. This is a must do geocache. We also did a couple of Lost places on our way to Dunkirk, 1 of them was in an old school. We arrived at our hotel not long before tea. A quick shower later and we walked to a restaurant just a few metres away from us. Our first blog for such a long time now. In future we will use more pics and less words but if you want any info of anywhere we have visited please get in touch. Thank you and welcome to our blog. We are Ian, Kate & Ben aka Basketcase Crew, our Geocaching name. We like many different aspects of Geocaching but nice walks together as a family is our favourite. We have finished many challenges we have set ourselves and thrived in each others company. We love to travel around the UK, Europe and of course Canada and the US.